December ushers in the cold weather, shorter days, and that good ol’ holiday cheer. I personally enjoy the hustle and bustle of holiday preparations, but I can also understand why some people get leery about it. The overall increase in consumer activities sometimes gets frantic, especially when it comes to the joyous merriment of elbow-to-elbow shopping and skirmishes for parking spots. 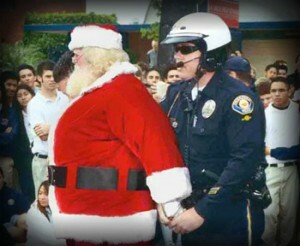 Along with this increase in consumerism comes another phenomenon: holiday crimes. It seems like every year, criminals invent new ways of taking advantage of unsuspecting victims in order to get at their holiday loot. Of particular concern this year is the sudden increase in what are called “porch thefts.” Many counties are reporting alarming increases in porch thefts, even in neighborhood communities that are generally considered as safe. Many people do their shopping online, and get their gifts shipped directly to their door. Porch thieves operate by intercepting the package before the recipient can get a hold of it. They do this by literally walking up to people’s porches and stuffing the packages into bags. While mail theft is a federal offense, this new breed of holiday bandit doesn’t seem to care. Car Break-Ins: Don’t leave your presents and gifts in your car! Thieves are targeting parked cars and breaking into them in search of gifts. Not even your locked trunk is safe. On a similar note, the classic neighborhood home break-in à la Home Alone is always a threat during December and January. DUI’s and Alcohol-Related Incidents: Along with the holiday cheer comes, well, holiday beer. This results in increases in DUI cases and public drunkenness charges, as well as alcohol-related domestic violence incidents. Some counties can rack up several hundreds of cases in a single holiday weekend due to DUI crackdowns. Fraud and Scams: Consumers as well as business owners should beware of the “12 Scams of Christmas”, especially those which use newer mobile apps to perpetrate identity theft. Retail Crime: Store owners and business operators should be watchful for shoplifters, especially during times when the store floors are crowded. Install security cameras: Having a visible, active security camera on your porch can do a lot to deter the new wave of porch thieves. Don’t leave your valuables in your car or in exposed areas. Only order from secure websites and don’t divulge your information to suspicious parties. Many holiday crimes can be prevented simply by being mindful of your purchases and belongings. Be sure to report any suspicious activity to the authorities, and consult with a lawyer if you have any legal issues or concerns.